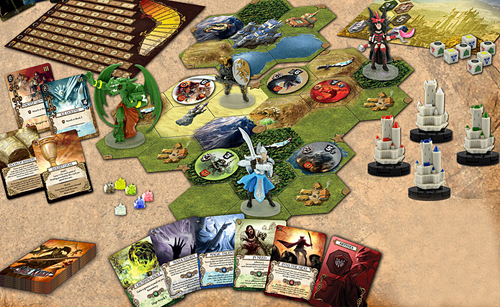 Mage Knight – These Aren’t Your Big Brother’s Clix! In the year 2000, Wizkids hit the market with their debut to the “Clix” system with a miniatures game called Mage Knight; it was a hit. Spawning Mech Warrior and the still-popular Heroclix titles for the company. Several years and multiple expansions later, Wizkids decided to release Mage Knight 2.0 and deem every figure previously created null and void in tournament play. Exit Mage Knight as we know it, and the eventual demise of Wizkids. Wizkids is back up and running, and really hitting some home runs as they slowly but surely reboot titles that were gaming staples for much of the first decade of the 21st century. Which brings me to this week’s review: Mage Knight the board game. The overview—Think 40K, D&D, MTG, and any LCG all mixed up together. It sounds schizophrenic, but it works. The base set comes with 4 characters that players choose from; you then embark on a scenario (1 of 11 included, or if you’re daring you can create your own or scale up or down your own) and into a land that is revealed as you explore. Along the way you encounter baddies, keeps, monasteries, dungeons…well, you get the idea. Killing a monster, conquering a keep, exploring (adding a new tile to the board) etc, will earn you “fame’ (Experience Points, the ultimate goal in most scenarios is to have the most fame) which allows you to level up, which gives you stronger stats, allows you to gain new skills, control more allies…sound familiar? Here’s where the game takes on a different spin, and becomes very intriguing. You control all of your actions through your “Deed” deck. You have 5 cards in your hand (you get a higher hand limit as you level up), and these cards dictate what you can do on your turn. There is no intricate time-based system to keep track of; there is no Dungeon Master telling you what you can or cannot do. There is a board that consists of tiles that are revealed as you explore, and your own deck of cards. You also cannot die—taking wounds doesn’t take away hit points, it only fills your deck with wound cards that clutter up your hand and inhibit you from taking more actions on your turn. Play continues in turns and rounds. A day round followed by a night round and so on. Day and night rounds have different effects on traveling across certain terrain and your ability to see what a certain baddy is before you jump into battle with it. The Mechanisms—They’re actually fairly clean and easy to learn—on the other hand, the multitude of combat rules and special abilities for your foes can be a little much to swallow when you first jump in. Playing cards to do anything and everything is a unique twist on a game like this, and you can really come up with some great combos to accomplish a lot on your turn, but it takes some good base knowledge of the gaming system and the cards in your deck. I really enjoyed this game, but be warned: If games such as Battlestar Galactica are a marathon to you, Mage Knight is an Iron Man race! The longest scenario included is estimated to be about 8+ hours! It’s definitely geared for a multiple-sitting experience. Beware—As with most games of this nature that take place in some sort of “fantasy realm” the use of darker magic and spell casting is highly prevalent. But there’s no flavor text on the cards, so as the game is played it feels pretty innocuous. About two rounds into the game I was informed that my character was a “Blood Cultist.” It didn’t really have any effect on the game play or the cards in my hand; all the players have the same cards—only different amounts of certain ones. I happened to have a few more cards that were more aggressive in nature, but as I leveled up I could easily select skills and cards that were geared more for healing and being a nice guy. But if casting spells and fighting wizards in towers and such gives you pause, it’s best to steer clear of this one. All in all, it’s a deep gaming experience, with nicely tuned mechanisms to help take out some of the randomness of most card-based systems. I’m hoping for expansions to come soon that will offer more characters that are of a less evil persuasion.